The 32 metre motor yacht Outta Touch has had a central agency change and is now listed for sale by Whit Kirtland at Bradford Marine Yacht Sales. Built in GRP by US yard Intermarine Savannah to a design by Setzer Naval Architects, she was delivered in 2000 with constant upgrades since. An interior by Sally J Ferguson uses polished burl cherry wood joinery throughout and accommodates eight guests in four cabins consisting of a master suite with a king sized bed, a VIP suite with a queen sized bed and port and starboard twins, all with flatscreen televisions and en suite bathroom facilities. In the saloon lounge area of this yacht for sale, the bar is located forward with seating for four guests. The bar has a sink, ice maker and wine cooler. Just aft to port and starboard are custom couches with storage beneath. Coffee tables are located in front of both couches and there are two swivel armchairs. A 52 inch Sony Bravia flat screen television is on the aft centre wall as part of an entertainment centre that includes a Bose stereo surround sound system. Further forward is the dining area with seating for eight guests, while further forward still is a state of the art galley with the added attraction of a three person settee and stool in front of a granite worktop for casual snacks through the day. Outside areas are generous and include a large aft deck with table and chairs and an extensive flybridge incorporating three helm seats, a bar, fridge and icemaker and U-shaped seating for eight guests plus a six person hot tub, sheltered by a GRP hard top. 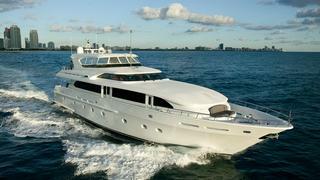 Twin 1,850hp MTU engines give her a cruising speed of 16 knots. Available to view in Fort Lauderdale, Florida, Outta Touch is asking $1,850,000.